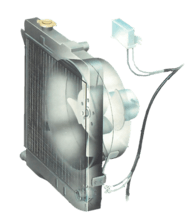 The parts of the cooling system most likely to give trouble are water hoses. Age and the movement of the engine on its mountings will eventually cause cracks, or their inner fabric may deteriorate due to the hot water. Inspect them when the engine is cold. 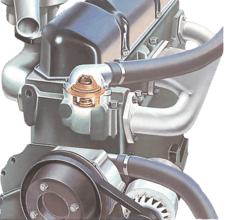 Any sign of wear or deterioration is a danger signal: the sudden loss of coolant from a burst hose can result in rapid overheating and a seized engine. A worn or damaged hose should be replaced as soon as possible. Before this can be done, you need to drain the cooling system. Remove the radiator cap and open the radiator drain tap. If there is no tap, disconnect the bottom hose. If the coolant contains antifreeze that you wish to use again, drain it into a clean container; do not drain it on to the road, it is poisonous (See How to flush an engine radiator). Before fitting a new hose, make sure it is the correct replacement. Some have built-in curves, others have different internal diameters at each end. Old clips should also be replaced preferably with worm-drive ones, which have a larger contact area and make a more effective seal. Never overtighten any type of clip: it may cut into the rubber. Once the hose has been replaced, turn off the radiator tap (or reconnect the bottom hose) and slowly refill with a water and antifreeze mixture. When reusing coolant with antifreeze, strain it through muslin or a plastic tea strainer. Replace the radiator cap and run the engine up to working temperature. Check for leaks, and tighten clips if necessary. 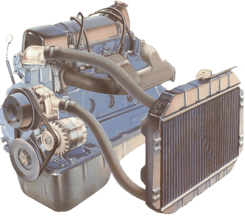 When the engine has cooled, make sure the system is topped up to the correct level. Never remove the pressurised cap while the engine is hot. It will release a jet of scalding liquid. Press or pinch the hose to widen any cracks so that they are easy to see. Look particularly at bends, junctions and where a hose clips on to a stub. Signs of swelling mean the inner reinforcing fabric is damaged and the hose may burst at any time. Feel for weak spots, which also indicate internal damage. Use a torch and mirror to look underneath or behind hoses. A brown rust deposit on the stubs indicates that the hose may be leaking when under pressure. Tighten the hose clips. Make sure the small valve moves freely. When you check the coolant level in the radiator, inspect the radiator cap as well. Ensure that the rubber or fibre sealing ring is not damaged, and test the large pressure relief valve by pressing it in against its spring some effort is needed! Make sure also that the small valve in the centre of it moves freely. A rough check on a cap's working efficiency is to warm up the engine, wrap the cap in a thick cloth, and then, wearing a stout glove, loosen it to its first stop. Do not remove the cap . If there is no hiss of escaping air or steam, the cap is probably not maintaining the correct pressure in the system, and should be renewed. Make sure that the new cap has the correct pressure rating, which is marked on it. A pressurised system raises the boiling point of water, but if the valve is too weak the pressure will not be maintained. If it is too strong the system may become over pressurised when the engine is hot. Unscrew the hose clip and slide it back. Always replace a wire clip like this with a worm-drive clip. The quickest way to remove a perished hose that will not pull free easily is to cut one end where it fits over a stub. Loosen the clip, slide it back, then slit the hose horizontally, using a sharp knife with a pointed blade. Cutting free a stubborn hose. Be very careful if the stub is plastic. A sharp knife may cut through the stub or score it badly. This end can now be removed, and by loosening the other clip and twisting the hose back and forth, the hose should come away easily. Clean any corrosion from the stubs before fitting a new hose. Two types of hose clip - the worm drive, which is the best, and the wire type which is liable to cut into the rubber. Slip the clips loosely on to the hose, making sure that the screw heads will be easily accessible when you come to tighten them. Push the hose ends well on to the stubs. If that is difficult, soften the ends in hot water and smear the stubs with liquid soap. If you use wire clips, wrap adhesive tape round the hose to stop the wire cutting in. If wire clips are used, wind adhesive tape around the hose underneath them, so they do not cut into it.